This article first appeared in The Edge Financial Daily, on November 3, 2017. If a simple, lazy weekend staycation is all you crave for the weekend, look no further than Villa Samadhi. 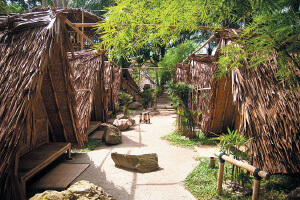 The resort comprises 21 villas, each designed to a “rustic-luxe” concept using wood, glass, bamboo, stone and black cement, decorated with Southeast Asian hill tribe antiques. There are five different room types to choose from, offering a range of facilities, including private balconies, whirlpools and even a private outdoor plunge pool. Villa Samadhi is located on Persiaran Madge, Kuala Lumpur. For reservations or more information, visit www.villasamadhi.com.my. Take off with friends or your significant other to Sekeping Serendah for a scenic getaway from the city. 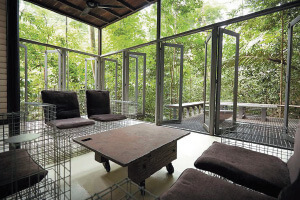 The resort is nestled in the green folds of a five-acre forest, with rooms that embrace the surrounding environment through open ceilings and glass walls. If the transition from concrete jungle to rainforest is not enough, television, Wi-Fi and mobile networks are unavailable at the establishment, allowing you complete isolation from the hustle and bustle of work which so often trickles into the weekend. Room rates start from RM300. For bookings or more information, visit www.sekeping.com. This weekend, Publika is celebrating World Vegan Day. Organised by the Malaysian Vegetarian Society, it aims to increase public understanding of veganism. Activities include yoga and meditation workshops, talks and Q&A sessions, and performances. There will also be game booths, and food stalls with vegan ice cream, burgers and even vegan fried chicken. 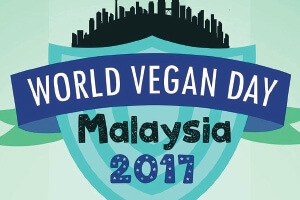 World Vegan Day Malaysia 2017 will be held on tomorrow and on Sunday. Publika Shopping Gallery is located on Jalan Dutamas 1, Solaris Dutamas, Kuala Lumpur. Look for the event listing on the venue’s Facebook page, Publika @PublikaGallery. Preserving music recordings, manuscripts and oral history with Khazanah National Bhd, Saidah Rastam has released her book’s second edition, Rosalie and Other Love Songs on cultural, racial and societal issues, the controversy surrounding Negaraku’s origin, illustrated talk with the author, Q&A session and a book signing, with music by the James Boyle Quartet and Bihzhu. The free event will be held this Sunday at 4pm to 6pm, at the Penang House of Music, on Level 4, Komtar, Jalan Penang, George Town, Penang. Call (04) 261 0282 or visit www.penanghouseofmusic.com. Indulge in an evening of classical music with the works of Purcell, Vivaldi, Bach and Handel. 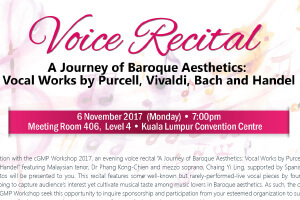 As the final instalment in the Pharma+Bio Asia 2017 series of scientific workshops, the voice recital A Journey of Baroque Aesthetics aims to spread appreciation for the arts, based on the idea that a high aesthetic value reflects a high potential for improvement and refinement in the fields of science and technology. Presented by tenor Dr Phang Kong-Chien, mezzo soprano Chaing Yi Ling, and Spanish pianist Mireia Frutos, the recital will explore some of the rarely performed works of the four major Baroque composers. A Journey of Baroque Aesthetics will be held at 7pm on Monday, in Meeting Room 406 of KLCC. For inquiries, email [email protected] or call (03) 6140 6666. Seven young singers converge at this concert to pay tribute to love in its many forms. The concert features the vocal talents of Lim Yee Fen, Sandy Cheng, Bui Yik Ling, Eugenie Foong, Austin Ng, Chang Chia Chi and Thang Kin Mun, bringing to the stage a mixture of genres ranging from opera to pop music. Accompanied by Khoo Khe Sin on the piano and Yong Jian Seng on the guitar, the singers will cover the bliss of romance, the anguish of unreturned love, and the warmth of motherly love, among many other types of love, in a moving performance that will speak to your heart. 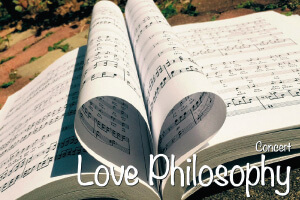 Love Philosophy will be held at 9pm tomorrow, at the Theatre Lounge Café, which is located at B1-3A, Plaza Damas 3, 63 Jalan Sri Hartamas 1, Sri Hartamas, Kuala Lumpur. 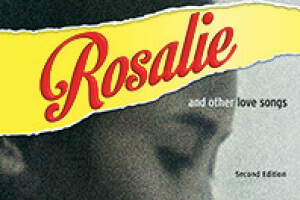 For bookings or more information, visit www.theatreloungecafe.com. The magic of J K Rowling’s iconic Harry Potter series is brought to life in the Harry Potter Film Concert series. Presented by CineConcerts, the show features the film adaptation of the first Harry Potter novel on a 40ft screen, accompanied by a live orchestra playing John Williams’ equally phenomenal score. The Harry Potter Film Concert series is a global tour performing in over 35 countries in the world, stopping in Malaysia this weekend. Whisk yourself into the wizarding world tomorrow and on Sunday at 8pm, at the KLCC Plenary Hall. Tickets are priced at RM228 to RM488. 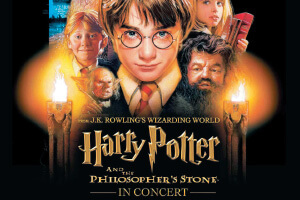 For more information on the concert series, visit harrypotterinconcert.com. Tickets are available at www.ticketpro.com.my. 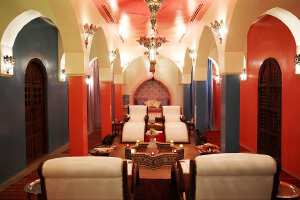 Pamper yourself with a relaxing spa day at Hammam Spa. Its popular signature spa package combines hammam — a Turkish bath with warm, steamy air — and gommage (exfoliation), leaving your skin soft and smooth. The full-body treatment involves the application of traditional Moroccan Black Soap, followed by an exfoliating scrub using a traditional hammam glove. The spa treatment is priced at RM168. Hammam Spa has outlets in Bangsar Village 2, Bangsar, Kuala Lumpur, and in Publika Shopping Gallery, Jalan Dutamas 1, Solaris Dutamas, Kuala Lumpur. For reservations or more information, visit www.hammamspas.com. Head to the Corus Hotel this weekend for their Weekend Hi-Tea. The hotel’s Dondang Sayang Coffee House rolls out a buffet spread on the weekends, rotating among four themes, namely Tradisi Nusantara, Spice of India, Country Western and Chinese Street Food. For just RM65 per adult, or RM39 per child, patrons can enjoy the delectable spread from 12.30pm to 4pm. 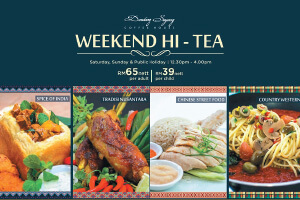 The Weekend Hi-Tea is available on Saturdays and Sundays, as well as on public holidays. The Corus Hotel is located on Jalan Ampang, Hampshire Park, Kuala Lumpur. For bookings or inquiries, call (03) 2161 8888.